(AD) and (CC) available on iTunes! iTunes pre-orders will have extra content, including additional scenes, more magic from Richard Turner, AND additional magic from the likes of Steve Forte, Jason England, Pop Haydn, Lennart Green AND more! Luke Korem is an award-winning filmmaker from Austin, TX whose previous work includes the feature documentary LORD MONTAGU, which chronicles the life of one of England's most controversial and iconic aristocrats of the twentieth century. Korem directed and produced the film, which premiered at London’s prestigious BAFTA and is now distributed worldwide. DEALT is Korem’s second feature film to direct. It premiered at this year’s SXSW Film Festival and won the Audience Award in the Documentary Feature Competition. DEALT will be coming to US theaters October 20th and distributed by IFC/Sundance Selects. Russell Wayne Groves’ career has included a wide range of narrative and documentary projects including MGM/Orion’s “Balls Out” (aka “Intramural”), a comedy featuring SNL’s Kate McKinnon and Beck Bennett; Crunch Time Season 1, a sci-fi comedy series; and “DEALT” a feature documentary following Richard Turner, widely considered one of the world’s greatest card magicians… and is completely blind, which recently won the Audience Award at SXSW 2017 and is being theatrically released by IFC’s Sundance Selects in October. Bradley Jackson is a screen-writer/ and novelist living in Los Angeles. His first feature film, "Balls Out" stars Kate McKinnon, Jake Lacy, Jay Pharaoh and Beck Bennett and premiered at the Tribeca Film Festival in 2014. The film was bought and distributed by MGM/Orion in 2015 and was selected as a Critics Pick by the New York Times. His first book – a middle grade novel (co-authored with Michael Fry) called "The Naughty List" was recently published by Harper Collins. The sequel – "The Nice List" – will be released in 2018. 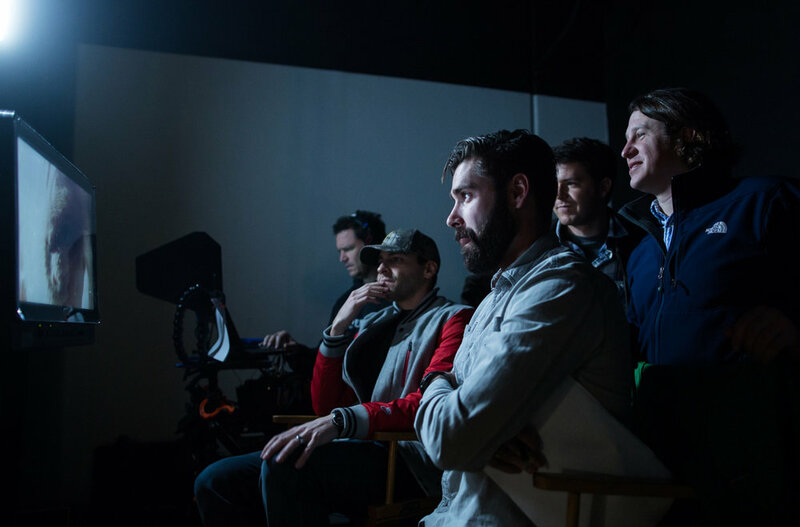 He also co-created the Sci-Fi comedy series "Crunch Time" for digital behemoth Rooster Teeth as well as co-wrote and co-produced the documentary "DEALT" which recently won the Audience Award at South by Southwest and was bought by IFC for a fall theatrical release. Former national and regional TV commercial producer, Andrew has gone on to produce feature doc, "DMT: The Spirit Molecule" (2011) starring Joe Rogan, released through Gravitas Ventures & Warner Bros Digital with a growing fan base of 1M+ Facebook fans. His first feature "Intramural" premiered at Tribeca Film Festival 2014, released by MGM/Orion Pictures as "Balls Out" in 2015. Produced on Rooster Teeth’s new sci-fi comedy series called CRUNCH TIME starring Samm Levine, Avery Monsen, and many more. Most recently co-produced on the feature documentary "DEALT" which recently won the Audience Award at SXSW 2017 and is being theatrically released by IFC’s Sundance Selects in October. Born and raised in Colorado, Derek moved to Los Angeles in 2004 to attend USC's MFA film program. Since graduating in 2007 he has edited numerous feature documentaries on a wide variety of subjects including the Iraq War, Mike Tyson and SpongeBob SquarePants. Previous films include the HBO Documentary Superheroes (2011), Academy Award-nominated The Invisible War (2012), and upcoming Netflix Original The Mars Generation (2017). Dealt is Derek's first project premiering at SXSW and he's pretty stoked about it. Jacob has worked on a multitude of international documentaries, short films, and commercials, while simultaneously embracing the people, cultures, and stories that surround him. Jacob is currently the cinematographer for DEALT, a feature length documentary about Richard Turner, a phenomenon in the magic world and is in post-production on his feature debut as a director, JUMPSHOT, a documentary about Kenny Sailors, the man who developed the modern day jump shot in basketball. Two-time Emmy Award winning Re-Recording Mixer and highly regarded Sound Designer, Tom Paul is one of New York City's most sought after talents in the field of post-production audio. The last few years have been filled with supervising and mixing the sound for many wonderful films including The Big Sick, City Of Ghosts, Weiner, Nuts!, The Wolfpack, Cartel Land, Particle Fever, The Square, and Doris to name just a few. Tom was honored to be the president of the jury for the feature doc competition at IDFA in 2016. Duncan Thum is a twice Emmy nominated composer and multi-instrumentalist based in Los Angeles, California. A host of sonic explorations lead Duncan from co-forming LA’s d.i.y. music scene fixture Pizza! to performance at the Disney Hall with Glenn Branca's Hallucination City: Symphony for 100 guitars. Duncan's muse crystallized in writing music for film, where story and image provide a poignant context for his eclectic background. Notable credits include Netflix's original series "Chef's Table" and feature documentaries "I'll Sleep When I'm Dead”, “Off The Rails” and “Dealt”. Duncan is a graduate of USC’s esteemed SMPTV film scoring program. Sebastian Örnemark is a Swedish composer based in Los Angeles. His Scandinavian influences and roots in classical music mixed with a passion for storytelling and curiosity is infused in his writing. Sebastian recently won awards for Outstanding Score (LA Web Fest) and Best Music (Seattle Web Fest) and was named “Composer to Watch” by The American Society of Composers, Authors and Publishers. He has conducted and recorded music at studios including Warner Bros., 20th Century Fox and Capitol Records. to receive news and SCREENING updates.